Taxpayers who missed January’s self-assessment deadline might see increased fines because of a delay in sending out penalty notices, experts have warned. HM Revenue and Customs (HMRC) normally sends warnings in February, but this year some may go out from late April. From 1 May the standard £100 fine rises by £10 a day – so when letters arrive, penalties could already be accruing. HMRC blamed increased workload from Brexit for the delay but said no one would be “unfairly penalised”. 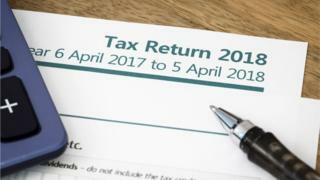 It is thought 746,000 taxpayers missed the deadline for tax returns to be submitted online on 31 January. In a notice issued on Friday, HMRC said: “We expect an increased demand in our call centres as the UK leaves the EU, so we intend to delay the issue of these notices to ensure we can provide the best service to our customers. “This will release those staff for EU exit related work. But the Association of Taxation Technicians warned fines could begin rising before some people had even received a letter telling them. Mr Stride is calling on HMRC to clarify whether it will take into account the late issuing of notices when considering a higher fine. An HMRC spokesman said: “No-one will be unfairly penalised as a result of this change. The vast majority will be aware they missed the January 31 filing date, as we do remind regularly with nudge messages before the deadline. A source at HMRC said if letters did get sent at the end of April, people receiving them would be given plenty of time to respond. Was the millennial dream killed by QE?